Hello. I wanted to share my update following appointment this morning at Hershey Medical Cenyer in PA. Dr. Did a full neuro test and found slightly brisk reflexes on left side. She seemed concerned with my jaw jerk reflex. She had a another neuro come in and do some reflex test and the jaw jerk. They said they didn’t find any clinical weakness. They are sending me for another full body emg and lots of bloodwork( comp metabolic, c reaction, alodose, and a mystani gravis panel to the Mayo Clinic and to a speech therapist for evaluation. Iasked her about als and she said it doesn’t look like it, but didn’t sound convincing. I didn’t like how she had another doctor come in and evaluate me too. I will update when my emg is when I get the appointment . I am very nervous. Any advice would be appreciated. I thank you for your time. In the absence of clinical weakness, no one is going to diagnose you with ALS. That’s great news! Sounds like the doctors were not thinking ALS either. The jaw jerk is non-specific. Some people can have hyper reflexes and a jaw jerk as a normal variant. The doctors are being thorough in wanting to evaluate further just to rule out other things that might be causing the jaw jerk. On examination, there are no concerns at this time from neurological perspective, however, as your reported symptoms could be due to various neurological causes vs. non-neurological, it is my duty to investigate potential neurological causes. We ruled out brain or cervical spine cause based on imaging. We will recheck EMG and labs and go from there. ***This is what my doctor said. Also, they said I have 1 beat clonus in ankle. That has me very worried. Any advice. Thanks for your time. Is that a normal response? Thanks Nikki. I will wait to post after EMG which will most likely be early January. Thanks for your time and I pray for peace and healing for everyone on this forum. Mental Status: History was consistent and coherent. Alert and oriented to person, place, time. Attention span was intact, and fund of knowledge was intact to current events. Speech is fluent without aphasia, apraxia, or dysarthria. 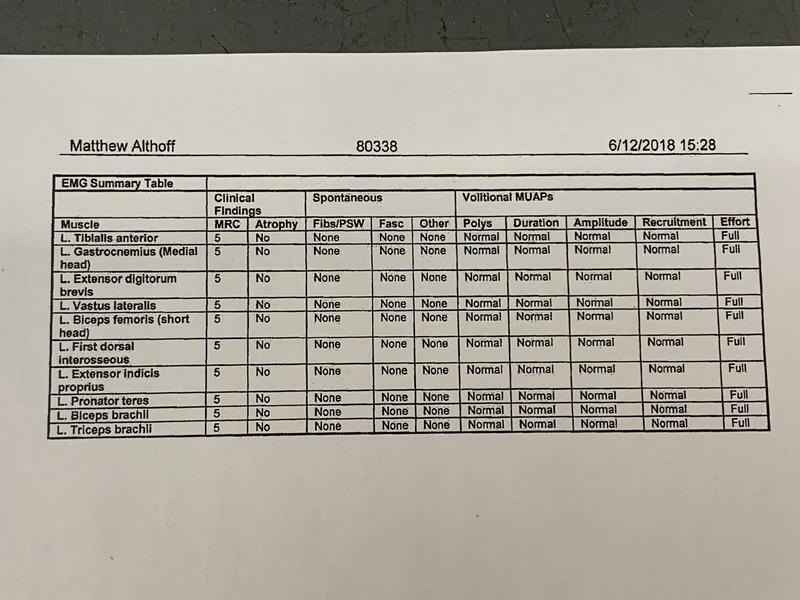 No notable speech abnormality or voice abnormality. Cranial Nerves: Pupils equal, round, and reactive to light bilaterally. Visual fields full to confrontation. Funduscopic exam: limited by pupillary constriction bilaterally. Extraocular movements were intact without nystagmus. No eyelid ptosis. Facial appearance was symmetric and full strength. Full, symmetric facial sensation V1-V3. Hearing acuity was intact to finger rub bilaterally. Palate and tongue were midline. Tongue movement was intact, full strength, no atrophy or fascics. There was no dysarthria. SCM and shoulder strength full bilaterally. HLD (hyperlipidemia). : Mother. HTN (hypertension): Father. Heart failure: MGF. MGF had Parkinsons, otherwise no family history of neurological disease. extremities. No involuntary movement. There were 1-2 beats of non-sustained clonus in right ankle. No tremor noted at rest or with action. No pronator drift. No observed fasciculations. Reflex: 3+ and symmetric in biceps, triceps, brachioradialis, patellar, Achilles. There was spread with patellar reflexes (ankle dorsiflexion). There was spread with biceps reflexes (finger flexion). Plantar reflexes downgoing. Negative Hoffman bilaterally. Negative jaw jerk. Sensory exam: Full sensation to light touch, pinprick, temperature, and vibration in all extremities. Negative Romberg. No extinction or neglect. Cerebellar: No incoordination with rapid alternating movements. Finger to nose and heel-shin accurate. Gait: Physiologic gait and station with full arm swing. Normal heel walk and toe walk. Normal tandem gait. pressure bilaterally, and recently diagnosed sleep apnea on CPAP presents for evaluation of various symptoms over the past 1 year, including left side weakness, perceived abnormal movement of tongue and face, perceived difficulty with speech and possibly swallowing, and perceived involuntary muscle twitches of face and extremities. On examination today, he has symmetrically brisk reflexes with spread, but no pathologic reflexes. He has 1-2 beats of clonus right ankle. He otherwise has normal cranial nerve function, strength, sensation, and gait. I did not note any tongue fasciculations, or other body fasciculations today. I reviewed outside records from his local neurologist, Dr. Chan, and he did mention noting some tongue "dyskinesias" on his examination, but in assessment found now signs of any serious neurological condition. I reviewed patient's brain MRI report which was notable for a 7 mm cyst stable since 2009, otherwise unremarkable. I reviewed his cervical spine MRI report which was overall unremarkable, no significant spinal stenosis or neuroforaminal stenosis. 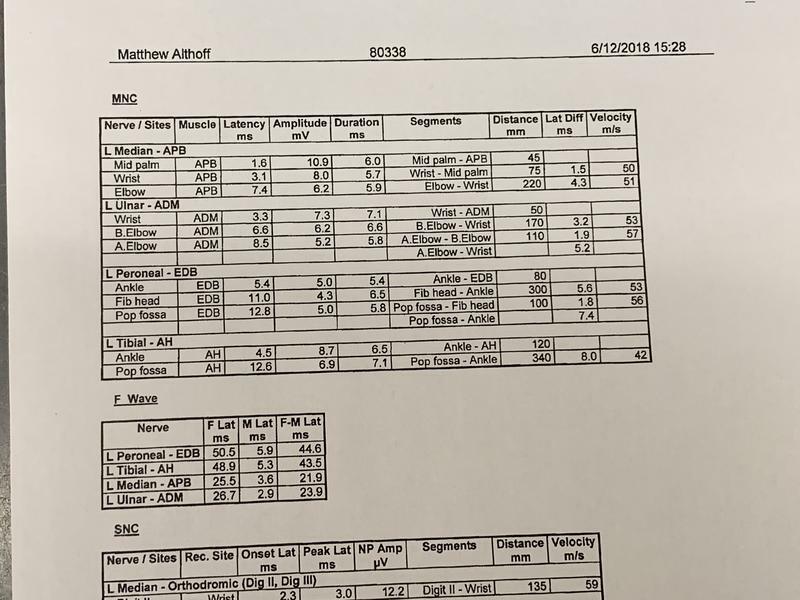 I reviewed his outside EMG of left arm, left leg from June 2018, and this was normal. I explained to patient that the cause of his various symptoms is idiopathic at this time. I wanted to share this with everyone. It is the complete notes from my exam. Can anyone tell me what “spread means when it comes to reflexes? Please any advice if there is something in the notes to be of concern. Thanks for your time. These are things you really should be discussing with your doctor, as they relate directly to you and your care and any next steps you should take. What this has ruled out is ALS- which is what this forum's focus is- we support people who have been diagnosed with ALS and their caregivers and is not intended as a health/medical resource for folks who do not have ALS. You've been provided with a huge amount of information by members here, but it is time to move away from your focus on ALS. 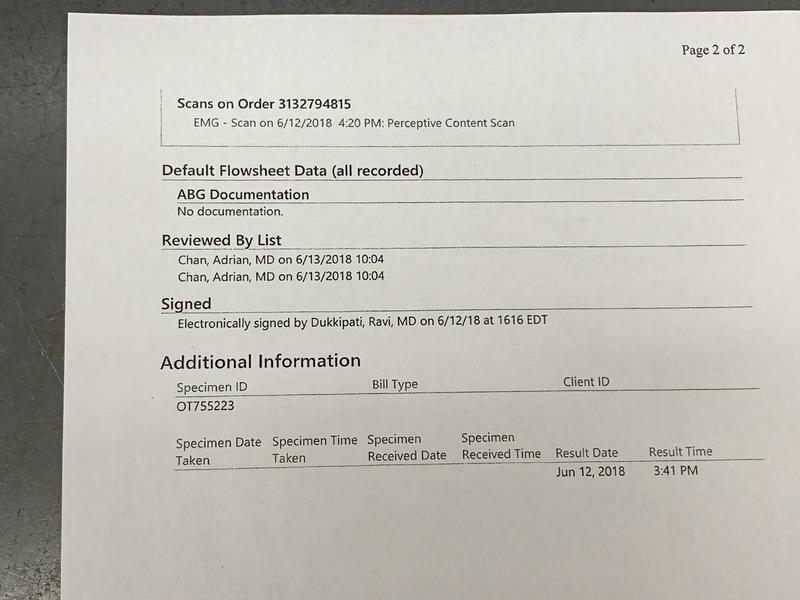 I reviewed outside records from his local neurologist, Dr. Chan, and he did mention noting some tongue "dyskinesias" on his examination, but in assessment found now signs of any serious neurological condition. Nor did he note pathologic reflexes. Please respect the forum and its purpose. Reread the READ BEFORE POSTING! Answers to common concerns about possible symptoms! thread if you are unclear of its purpose and what to do once the people here have answered your many questions. Pay particular note to the last two sections of that post. I’ll explain to you how this rules out ALS. The neurologist did a very thorough exam. S/he reports that your strength was normal on exam. Normal strength = no ALS. Normal EMG = no ALS. 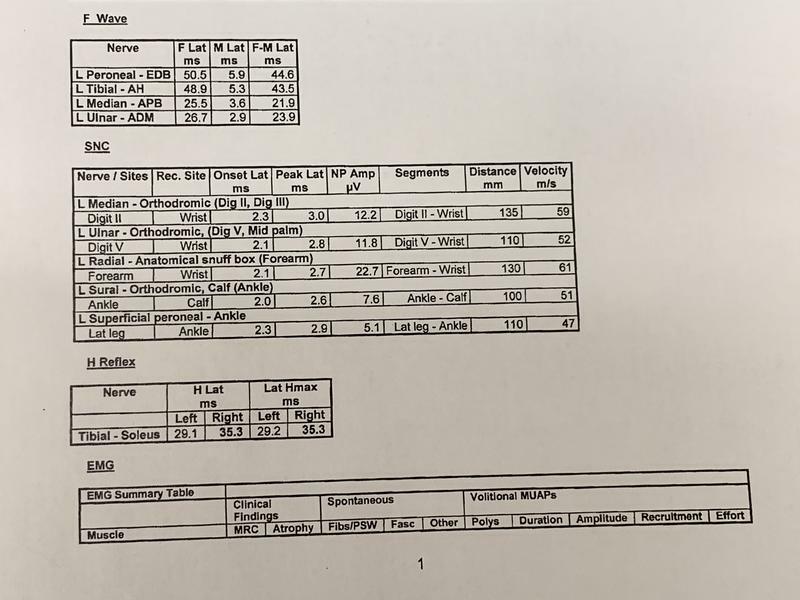 Normal strength on a neurologist’s exam and normal EMG rules out ALS. How much clearer could this be? 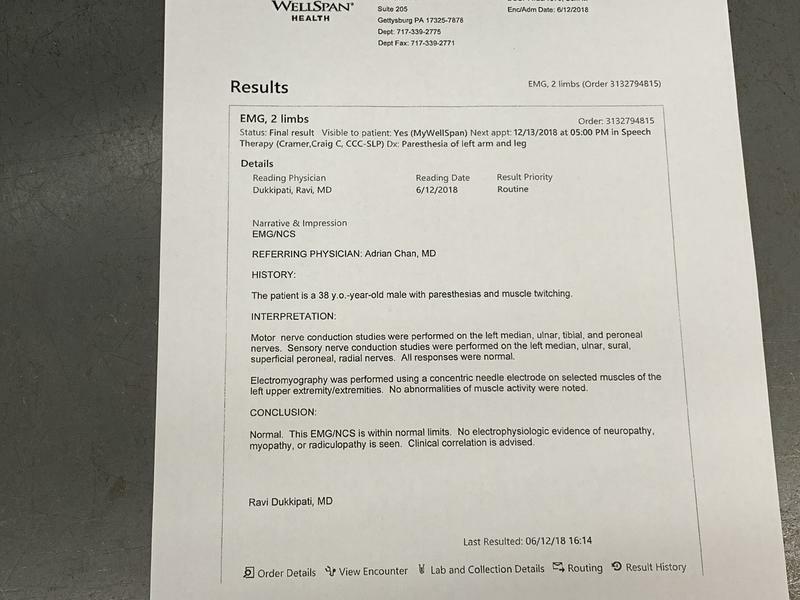 Also, doctor states assessment found “now (typo, should read “no”) signs of any serious neurologic condition.” And “the cause of his symptoms is idiopathic”. That means they didn’t identify a cause but they did rule out ALS and any other “serious “ neurological condition. I think this pretty clearly rules out ALS. You’re good to go. Please honor your promise. Karen, I will uphold my promise. Please just answer me what the “spreading” of reflexes and the clonus mean? Also, when the doctor said “ no sign of serious neurological disease” was posted back in September. My emg is scheduled for January 14th. If you guys could touch on that question, I will update after that appointment. Thanks for your time and patience with me. Mod note- closing thread. Malthoff, this forum is not a medical resource you can use any longer. Please seek proper medical help. Forgive me for coming back. Please view my attachments. I finally was able to get my hands on my EMG results from June 12th. My only questions are do the NCS and EMG result look ok and if my symptoms started at the end of May, would an EMG have been done too early? Please advise. Thanks for your time.